Content Prediction is one piece of the larger Fast Play puzzle, but it's an important one. Content Prediction lets the Chromecast start to buffer a video before you even press the play or Cast button on your smartphone, with the idea that the video will start playing, essentially, instantaneously once you start it. This is obviously very desirable, as it helps remove the "delay" aspect of viewing a video on Chromecast. 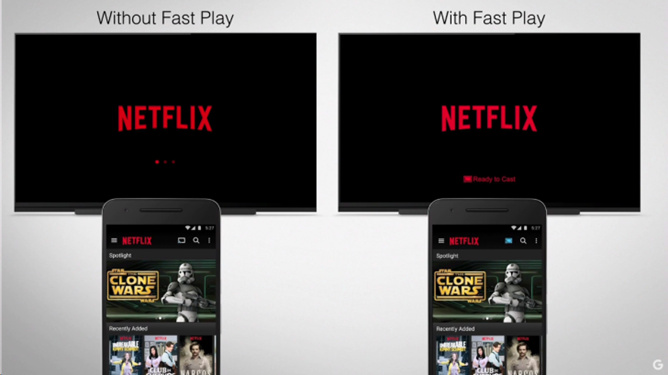 Heck, this feature could make using your Chromecast substantially quicker than Android TV, even! The feature was supposed to go live with Netflix initially, and Google apparently did test it in a limited early access phase, but identified some issues and areas for improvement in the experience. As such, Google decided to hold off on the consumer launch of Fast Play Content Prediction, though we have been told that it will launch later this year. Changes to the API and framework are currently being made to improve the experience based on that early access testing. Originally, Google had planned to roll out the feature early in 2016, with developers making compatible apps available around the same time. So, hopefully you'll be seeing it before the year is out. Or rather, not seeing it, because your videos will load that much more quickly.